Dolce’s instructions are easily satisfied in pictures that can be read two-dimensionally, that is, from left to right, as we do with a text. But what happens when the action moves from the foreground into pictorial depth? Time follows a more circuitous path when represented in three dimensions. Artists developed numerous strategies for capitalizing on the flexibility three dimensions present. In The Meeting of Saint Anthony and Saint Paul (c. 1430/35), a predella panel by the Master of the Osservanza, the viewer comes in at the end of the story and works back to the beginning. 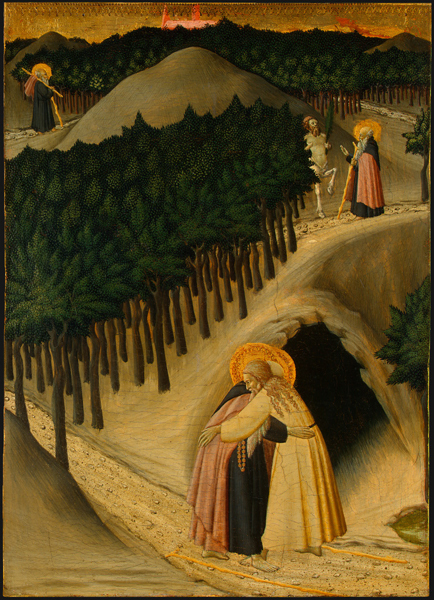 Viewing the painting in the conventional manner we start in the foreground, where Saint Anthony and Saint Paul embrace at the conclusion of Saint Anthony’s long journey. Sweeping past the two saints is the rough path that has carried Saint Anthony to this momentous meeting. As we follow its serpentine course into the depths of the picture, we are drawn back in time and space. Snaking back and forth, the path occasionally disappears behind a dense forest or steep hill, or extends beyond the edge of the picture—thereby suggesting the immeasurable lengths and unfathomable experiences of Saint Anthony’s journey. Along the way we catch additional glimpses of the saint. Midway back he is confronted by a centaur, one of the monstrous creatures that surprised him on his trip. At upper left he appears for the last time (or, strictly speaking, the first), setting out on his arduous journey. His tiny size indicates how great a distance separates him from his final destination. Saint Anthony cannot see the adventures that lie ahead, but we see them all simultaneously. The obstacles, frights, and uncertainties he encountered help us empathize with the warmth of the culminating embrace when Saint Anthony at last meets his fellow hermit. The method of continuous narrative thus allows us not only to walk along, step by step, in his shoes but also to grasp the entire story at once as it unfolds from beginning to end—or rather, from end to beginning. Saint Anthony Abbot (251–356) was an Egyptian who, at the age of twenty, sold all his belongings and pursued a hermit’s ascetic lifestyle. He overcame many demonic temptations and gained numerous disciples. Late in life, Anthony went on a journey in search of his fellow hermit, Saint Paul. On his way he encountered a number of monstrous creatures before a wolf finally led him to his destination. Every day a raven brought double portions of bread to the two hermits. Later, after seeing a vision of Saint Paul’s soul ascending to heaven, Anthony returned to bury Paul. Two lions came to his assistance and dug the grave with their paws.